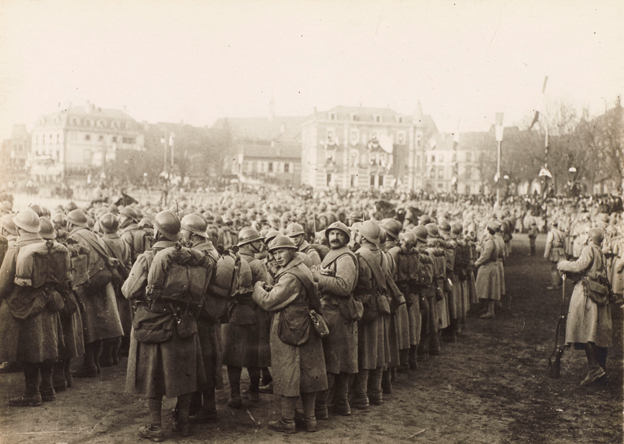 In Colmar, French troops march in Rapp Square. “What a hotchpot demobilisation is! ”, recounts one of the soldiers demobilized in the newspaper Excelsior: “At Gare de l’Est in Paris. In 1914, it took you four hours to become a troufion. 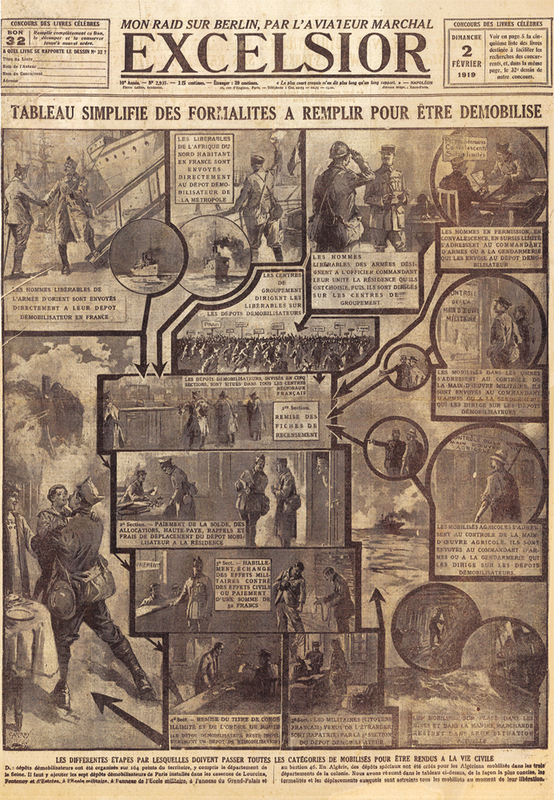 In 1919, it takes you two weeks to become civilian again. It took me sixty-two hours to get here from Strasbourg! It took five hours to get from Nancy to Toul, which is 28 kilometres away… You would have been better off walking! “. © Paris, musée de l’Armée, dist. RMN-GP / Émilie Cambier. Adrian helmet of a demobilised soldier. The copper plate placed on the visor mentions: “120th Infantry. Great War soldier.” © Paris, musée de l’Armée. 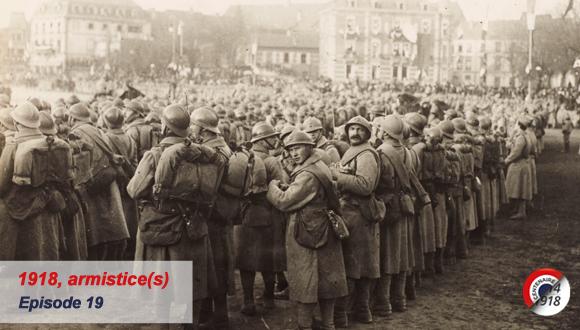 From the armistice, the period of demobilization, with its joys, but also its lulls, its offences, etc., began for more than four million French soldiers. While England gave priority to the needs of the economy, the demobilisation of the French took place by age group. In application of the Armistice Treaty, it was essential that military pressure be maintained and the withdrawal of German troops controlled, that stability be ensured by maintaining order, administrative continuity guaranteed, aid provided to the people, reconstruction and so on. 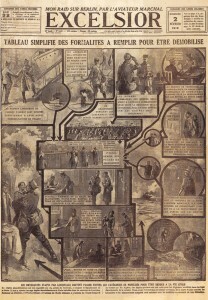 The men still mobilised, among Allies and partners, were assigned to those tasks. Their fashion show, their daily presence, particularly in Alsace-Lorraine and Rhineland, make it possible both to show a force that is still active and dissuasive but also to postpone, especially for the French, the return of a mass of men whose reintegration must be ensured in a civil society that had functioned without them for more than four years. Lastly, the war continued on other fronts, in the Levant, in Russia and in Eastern and Central Europe. The means of transport and funding to carry out the demobilisation were also lacking, particularly for overseas soldiers. 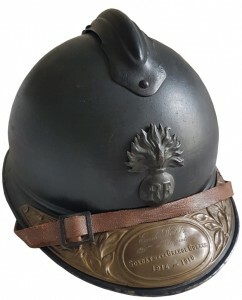 During the demobilisation, carried out in multiple stages, the combatant, valid or invalid, returned his military equipment and received in exchange a scallop note and compensation and, if he wished, an Adrian helmet, a plaque engraved with the words “Soldier of the Great War 1914-1918” and a civilian suit called “Abrami suit” or 52 francs if he did not wish for the latter.